Like many students at Brigham Young University, Adam Law spent two years on a mission. When he returned, he struggled for a season as he acclimated to the daily rigors of being a college athlete. But he blossomed as a junior for the Cougars this year and finds himself tackling another big project: pursuing the family business. Law, the son of former Major League outfielder Vance Law and grandson of former Cy Young Award winner Vern Law, was selected by the Dodgers in the 12th round of this year's Draft. So far, he's doing the family name well. The 23-year-old went 5-for-5 with an RBI and two runs scored on Tuesday night in Rookie-level Ogden's 6-4 setback at Billings. "That's my first five-hit game as a professional. I was fortunate to have one in college earlier this year, but that's probably a game that'll stand out for me," Law said. "I'm happy to be here and have an opportunity to hopefully make it somewhere. And it always helps to get off to a hot start, feel confident in your abilities." When Law returned from his mission to Zimbabwe, where lived as a 20- and 21-year-old, it was tough to get back in the swing of high-level baseball. 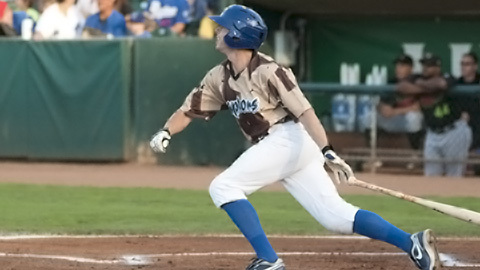 He hit .221 in 46 games in 2012 as a BYU sophomore. This year, things began to feel right again and he batted .365/.440/.510 in 53 games. "I'm actually just starting to get myself back to where I feel I should be, in terms of timing, strength, abilities like that," he said. "The hardest part is to not go all-out right when you get back because that's when you get injured. You can't take 1,000 swings a day, you have to ease into it, especially in the weight room. It's frustrating because I knew where I could be, but I just couldn't get there until I had the building blocks in place." Law's continued his hot hitting since leaving the college ranks. After Tuesday's display, he's hitting .364 in 15 games with the Raptors. That follows a 33-game stint in the Rookie-level Arizona League, where he batted .357. Between the two levels, he has an overall line of .359/.417/.439 in 48 games with 27 RBIs and 35 steals in 38 attempts. The Utah native stressed that despite missing out on a couple years of baseball, his time in Zimbabwe was better than anything else he could have been doing. "It's an experience that I wouldn't trade for anything in this life," he said. "The biggest thing I took from there was how blessed we are in the United States. People in Africa really have nothing and yet they seem so much happier as a people, they thrive on their family relationships. They make the most of what they have, which is not much." As for taking up the mantle of the Law baseball legacy, he said the pressure that accompanies his last name has actually subsided. "I mean, there's always pressure growing up because a lot of people know who you are, especially at the local level. But now at the professional level, a lot of guys on my team actually have had fathers that played professionally. It's just not as prevalent as it was growing up. "It's just an honor to represent the Law family, and I try my best to do it well because my father and grandfather were great baseball players but even better men. "I talk to both of them virtually every night. My father is an instructor with the White Sox, so it was an interesting experience when we played their Rookie-ball team. He coached against me, which was a first-time thing. I can get tips from my grandfather, he throws batting practice to me and he's 83 years old. Still painting the corners, throwing a good breaking ball, it's just a great thing to have them with me around the game because it really helps my mental side. I have some of the best resources out there." Despite Law's heroics, the Raptors could not overcome an early four-run deficit. Carlos Sanchez homered and drove in three runs, helping the Mustangs record back-to-back home wins for the first time this season.